The MLA membership ratification vote on Resolution 2017-1 opened on April 19 and will close on June 1, 2017. From the very moment that the MLA announced that members will be voting on a resolution calling on the association to “refrain from supporting the boycott” of Israeli academic institutions, many scholars and students expressed opposition to what is unabashedly a pre-emptive attempt to protect Israel from future criticism within the MLA. The Delegate Assembly’s marginal vote in favor of Resolution 2017-1 has caused many scholars and students to question their future membership in a professional association that has been taken over by a group of pro-Israeli ideologues who are prepared to repress members’ rights in the interest of defending Israel. One of the world’s most important academic organizations [the MLA] has a choice: uphold academic freedom, or provide cover for Israel’s crimes. In a 2014 op ed for the New York Times, Omar Barghouti, one of the Palestinian leaders of the Boycott, Divestment and Sanctions (BDS) movement, noted that “Prime Minister Benjamin Netanyahu effectively declared B.D.S. a strategic threat. Calling it the ‘delegitimization’ movement, he as signed the overall responsibility for fighting it to his Strategic Affairs Ministry. But B.D.S. doesn’t pose an existential threat to Israel; it poses a serious challenge to Israel’s system of oppression of the Palestinian people, which is the root cause of its growing worldwide isolation.” Since 2014, the boycott Israel movement has continued to grow and so has Israel’s and its US allies’ efforts to crush international solidarity with Palestinians. 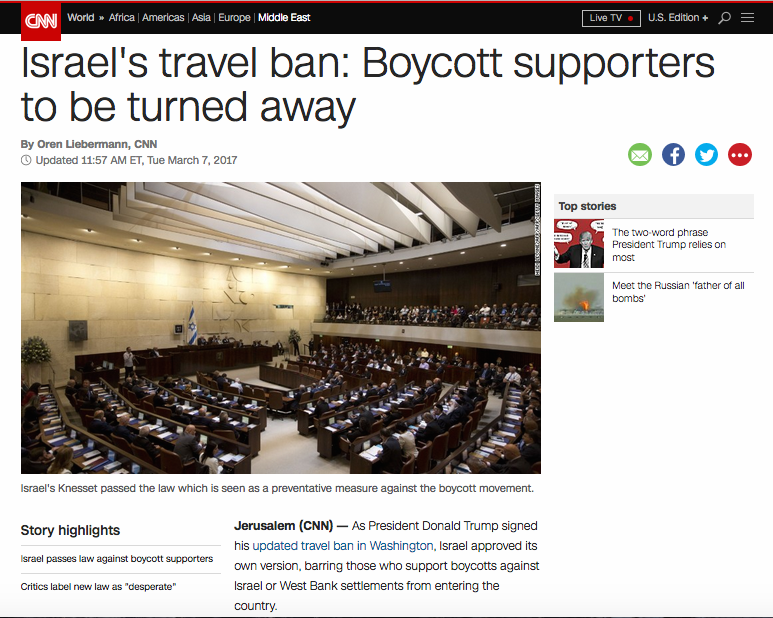 As reported in Haaretz, Israel’s assaults on the boycott movement range from the imposition of a 2016 travel ban on Barghouti (and more recently his arrest in 2017) to the passage of a 2017 law “barring those who support boycotts against Israel or West Bank settlements from entering the country” (see cnn.com report). MLA Voting Now Open: No on Resolution 2017-1! As former presidents of the Association, we wish to comment on Resolution 2017-1. We think that it misrepresents the MLA’s mission, defining the Association’s role in an erroneous, narrow way that directly contradicts past and present practice. We also think that this resolution unduly restricts the membership’s ability to act in the future. #Vote No on Resolution 2017-1/Protect Free Speech. We, the undersigned, strongly oppose MLA Resolution 2017-1 , which seeks to enshrine within the association a repressive anti-boycott position. Adoption of this resolution will have a chilling effect on free speech, will serve to repress human rights advocacy on behalf of Palestinians, and will result in the resignation of many MLA members. . . . The following statement was posted on April 12, 2017 on the MLA Delegate Assembly Resolution 2017-1 comments site. A similar letter was sent to the Executive Council of the MLA protesting the ill-considered resolution, which seeks to repress the free speech of MLA members who endorse boycotts. At its January 7, 2017 meeting, the MLA Delegate Assembly voted against a resolution (2017-2) to endorse the boycott of Israeli academic institutions and in favor of an anti-boycott resolution (2017-1). The discussion of the two resolutions during the Delegate Assembly meeting was marked by a number of exceptional procedures that worked in favor of the anti-boycott position. But setting aside the procedural issues, the leadership (former MLA President Anthony Appiah and some Executive Council members) made public statements in advance of the vote that aimed at delegitimating the pro-boycott resolution. And on the very day of the vote, as the Delegates prepared to debate the pro-boycott resolution, a member of the MLA Executive Council made a motion to revise the resolution, stating that an endorsement of boycott in no way was binding on the association; the motivation behind this motion was grounded in a concern that the MLA might open itself to a lawsuit should the Delegate Assembly vote in favor of a resolution to boycott Israeli academic institutions. The motion to revise the pro-boycott resolution was defeated, but it raised the threat of the lawsuit, which the Brandeis Center for Human Rights Under Law had made in a letter to the MLA.